In which hundreds of people dress up as Santa Claus and wander the streets of San Francisco, united by the shared goal of getting drunk. 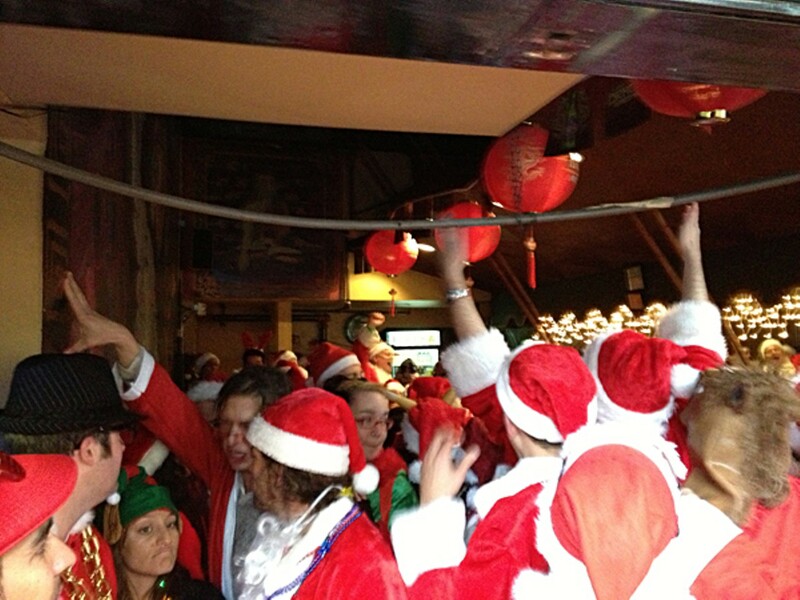 Getting inside an actual bar during SantaCon wasn't easy. SantaCon is a yearly debaucherous event that started in San Francisco and now happens all over the world in which people (mostly young white professionals) dress up like Santa (or Slutty Claus, if you're a chick) and basically go bar-hopping around the city, often spreading douchebaggery as they go. For good reason, the event has earned a bad reputation (it's also known as Santarchy). In New York, some bar owners have refused to serve anyone dressed as Santa. Which is why organizers of this year's San Francisco edition of SantaCon implored its attendees to do good deeds: Hand out candy canes! Give homeless people socks! In other words, "less bro, bro, bro... more Santa!" Why my friend wanted to attend this event and why I agreed to accompany her are still mysteries to me. Nonetheless, there I found myself last Saturday morning, riding BART into the city wearing a pair of fuzzy antlers (dressing as Santa accessories is acceptable). We made our way to Union Square, the official starting point of SantaCon. There, scores of Santas milled about in the cold rain, singing Christmas songs, admiring one another's costumes, and posing for tourists. The crowd seemed to be mostly twentysomethings, sprinkled, somewhat surprisingly, with some fifty-year-olds, and a few in-betweeners like us. Seductively dressed young women danced on tables, and men drank tall cans out of brown bags. A few naked Santas drew gawkers. It was a spectacle that required more than a few minutes to soak in. As it soon became clear that all we were doing was, in fact, getting soaked, we decided the best plan of action would be to head to the nearest bar. Of course, that's what all the other Santas thought of, too. Lines were thick to get in to already-packed bars. And this was before 1 p.m. It seemed the bros had the best idea after all — we decided to brown-bag it. Not being big drinkers, we headed to the nearest liquor store and bought tiny bottles of Baileys, then went to Starbucks and got lattes to make Irish Coffee. It was the perfect drink to warm our chilled bodies, and our only hope of surviving SantaCon with smiles on our faces. Despite the rain, we slogged it to North Beach (one of several possible SantaCon destinations), where, organizers promised, there would be a large number of SantaCon-friendly bars. Li-Po Lounge was the first watering hole we actually got inside of, largely because we happened to be out front right when it opened. The small staff was instantly overwhelmed, and hustled to meet the demand of the thirsty Santas. Overall, the vibe was merry and thankfully not too obnoxious. A Burning Man contingent from East Oakland's NIMBY warehouse broke out into an East Bay cheer. Responding to organizers' requests, candy flowed freely: Candy canes littered bathroom floors, and people traded chocolate for mints, and vice versa. Soon the bar began to swell with Santas, so we squeezed our way out and headed to Monarch at 6th and Mission streets, where the official SantaCon dance party was being held. Despite being the middle of the afternoon, the place was packed. Upstairs, the DJ spun a fun mix of Eighties hits. Downstairs, house music thumped a steady beat for Santas sweating it out on the dance floor. Couples made out on a condom-strewn stage, girls grinded each other, and men watched them. It was, in other words, just like any other Saturday in the city. All in all, it was not the worst way to spend a Saturday afternoon. It made us wish there were more afternoon dance parties, more random strangers who wanted to pass out candy, more excuses for people to dress up and break out in collective song. It was actually kind of fun — even after the Irish Coffee buzz wore off.